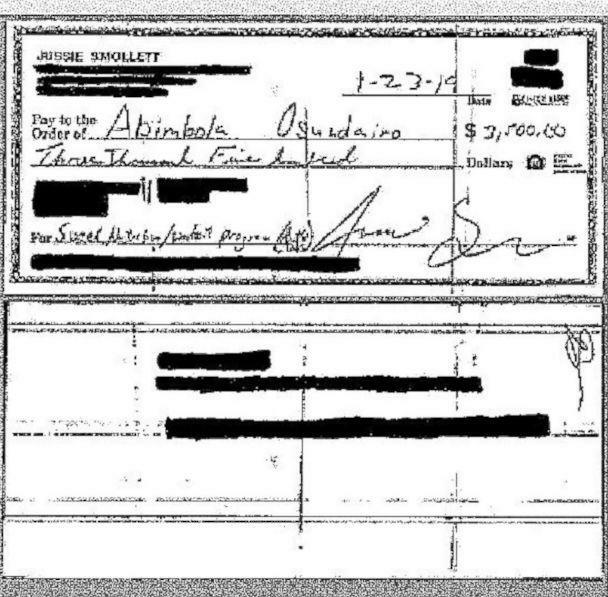 ABC News has obtained a copy of a $3,500 check apparently written by "Empire" actor Jussie Smollett to Abimbola Osundairo, one of the two brothers who police say helped stage an attack on Smollett in Chicago last month. Meanwhile, Chicago Police Superintendent Eddie Johnson, appearing exclusively on ABC's "Good Morning America" on Monday, doubled down on his contention that the 'Empire' star fabricated the account. The check's memo line reads, "5 week Nutrition/Workout program (Don't Go)." The check was dated Jan. 23, six days before Smollett claims he was attacked in a hate crime. A copy of the check was first published online by TMZ. Sources close to Smollett told ABC News the actor was starting to train for an upcoming music video titled "Don't Go," in which he had to appear shirtless. ABC News obtained a calendar entry of Smollett's that indicates the video was scheduled to be filmed Feb. 23. The $3,500 check was $600 per week for the workout plan, plus $100 per week for the nutrition plan, over five weeks, a source close to Smollett told ABC News. Johnson said the Osundairo brothers told police that Smollett gave them a $3,500 check to carry out the elaborate scheme. But there is more to investigators' confidence in their conclusion that the public has yet seen, he said. "Let me tell, you, Robin, there’s a lot more evidence that hasn’t been presented yet, and does not support the version he gave," the police chief told "GMA" anchor Robin Roberts. "There’s still a lot of physical evidence, video evidence and testimony that just simply does not support his version of what happened." Johnson made a point to note that statements about the case are not opinions, but based rather on a surfeit of evidence gathered by investigators before the actor was charged. "It's important for people to recognize that it's not the Chicago Police Department saying he did something, it's the evidence, the facts and the witnesses that are saying this," he said. 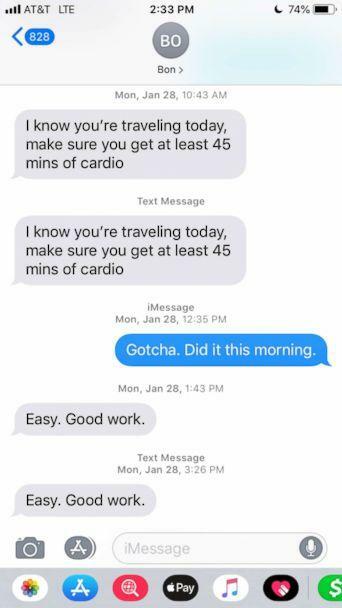 ABC News has also obtained copies of text messages apparently between Smollett and one of the Osundairo brothers, whom he calls "Bon," in which the two discuss exercise and meal plans in the days preceding the alleged attack. 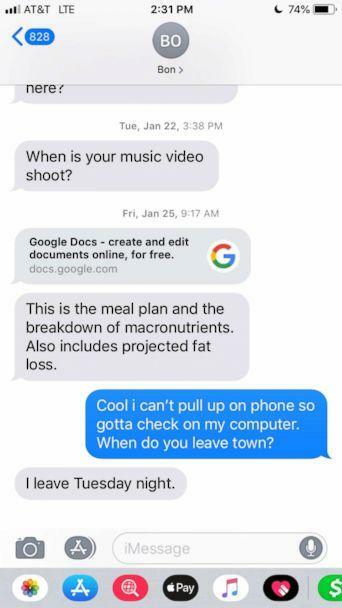 In one of the texts, dated Jan. 25, Bon writes, "This is the meal plan and the breakdown of macronutrients. Also includes projected fat loss." The copies of the text messages also were first published online by TMZ. Smollett told police he was attacked by two masked men near his apartment in Chicago around 2 a.m. on Jan. 29. The two men, Smollett initially said, shouted racist and homophobic slurs at him as a rope was wrapped around his neck and an unknown chemical substance was poured on him. The alleged assailants yelled "MAGA country," a reference to President Donald Trump's "Make American Great Again" slogan, police were told. Police identified and questioned two "persons of interest" captured on surveillance video near the scene around the time of the alleged attack. The men, Abimbola and Olabinjo Osundairo, were arrested on Feb. 13 but then released without charges, with police saying they were no longer considered suspects. While being questioned by investigators, the brothers claimed that Smollett paid them $3,500 to help orchestrate and stage the crime after he became upset that a letter threatening him, sent Jan. 22 to the Fox studio where the television series "Empire" is filmed, did not get enough attention, law enforcement sources told ABC News. The memo line on the $3,500 check read that it was for personal training, sources said. 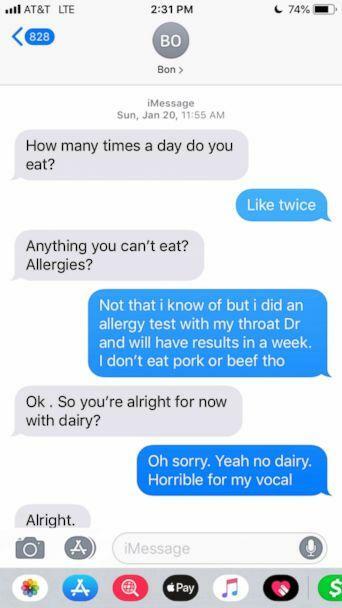 Police obtained a search warrant for the check and have text messages between Smollett and the brothers as well. A Chicago Police Department spokesperson referred ABC News to the Cook County State’s Attorney when asked for comment, but added, "In the interrogation they [the brothers] told police about the money. That interview is also electronically recorded." Last Wednesday, Smollett was charged with felony disorderly conduct for filing a false crime report. By that evening, police officially had classified the actor as a suspect in the ongoing investigation. Detectives subsequently presented evidence to a Cook County grand jury. Smollett, who has consistently denied any role in staging the supposed crime, turned himself in to police Thursday morning. A judge set bond at $100,000 and ordered Smollett to surrender his passport. The actor, who pleaded not guilty, was released after posting 10 percent of his bail. His next court appearance is scheduled for March 14. 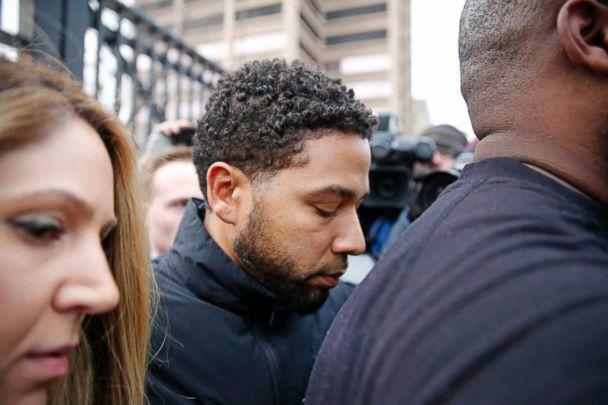 Speaking at a news conference on Thursday, Johnson accused Smollett of first sending himself the bogus letter filled with "racial, homophobic and political language," then orchestrating the alleged attack because he was "dissatisfied with his salary." "When that didn’t work, Smollett paid $3,500 to stage this attack and drag Chicago's reputation through the mud," the police chief, visibly angry, told reporters. "Jussie Smollett took advantage of the pain and anger of racism to promote his career," he added. "Why would anyone, especially an African-American man, use the symbolism of a noose to make false accusations? How could someone look at the hatred and suffering associated with that symbol and see an opportunity to manipulate that symbol to further his own public profile? How can an individual who's been embraced by the city of Chicago turn around and slap everyone in this city in the face by making these false claims?" ABC News' Monica Escobedo, Andy Fies, Chris Francescani and Stephanie Wash contributed to this report.